If you are purchasing a home with FHA 203k financing, there are a few steps and responsibilities you should be aware of to ensure your closing process goes as smooth as possible. The FHA’s primary goal is to help borrowers purchase a home that they may not otherwise be able to finance based on the down payment requirements of most Conventional loan programs..To further that goal, FHA offers favorable loan terms, higher loan limits, and flexible down payment options to qualified buyers. While candidates are not required to have as large a down payment or the income amounts mandated by many conventional loan programs, they will need to show evidence of a steady, verifiable income and a good credit score. Credit qualification, loan limits and other requirements for all FHA 203k loans are the same as regular FHA loans. Borrowers must demonstrate the willingness and ability to repay the loan. Like regular FHA loans, maximum loan amounts depend on the property’s location. The distinct difference between regular FHA loans and the 203k programs is that 203k rehabilitation loans are specifically designed to offer loans on distressed, outdated, uninhabitable or poorly maintained properties that may be unable to qualify for Conventional loan programs. In addition to the purchase price of the home, the FHA 203k loan allows the borrower to project costs and include the funds needed for the rehabilitation and related expenses, such as materials and labor. You can also assure your real estate agent that our 203k Lending Team will keep them in the loop at every step, as well as notify them via phone, email or smoke signals when there are important documents or details that we need. Most real estate agents and buyers are apprehensive about purchasing a home with an FHA 203k Loan due to their lack of experience with these great rehab loan programs, and the fear that they’ll accidentally mess something up. Don’t worry though, most experienced 203k Lenders prefer to take control over the entire process to guarantee things get done right. Basically, as long as you’re working with a Rehab Loan Expert, you’re going to be just fine. Either way, we have outlined below how the typical 203k loan advances, beginning with the location of a qualified property and ending with the last inspection and final release notice. Once a property is identified and before entering into a sales contract, the buyer and their real estate agent should perform an analysis to determine the extent and a rough cost estimate of repairs, and the market value of the property after completion. *Note: A good HUD Consultant can simplify this step for the borrower. The sales contract should include a provision that the buyer has applied for FHA 203(k) financing, and that the contract is contingent upon loan approval and buyer’s acceptance of additional improvements that may be required by HUD or the lender. The borrower provides information for the lender to request a credit report, verifications of employment and deposits, and any other documentation needed to establish the ability of the borrower to repay the mortgage. The HUD Consultant will inspect the property and prepare a work write-up and stimated costs. Once the lender accepts the Work Write-up and cost estimate, they will request a HUD case assignment number and an appraisal. Nearly all lenders require that both the borrower and the property qualify for the mortgage, and a property’s value is established through an appraisal. 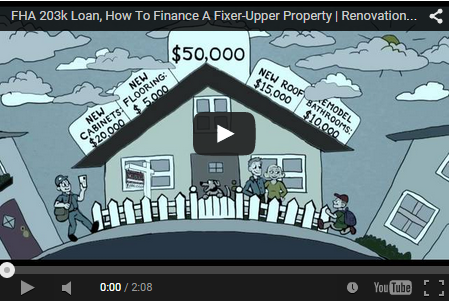 The lender must be certain it can recover the investment if a borrower defaults on the loan. Lenders rely on a real estate appraisal to demonstrate a property’s current, after-repair market value. This value is used to support the purchase price or determine the equity held by a current homeowner. Final loan approval will depend in part on a satisfactory appraisal. The critical difference between a traditional loan appraisal and an FHA 203k is that the 203k appraisal is based on the projected value of the home after repairs are complete. This means the 203k appraisal reflects an estimation of how much the property will be worth after the renovation. A traditional appraisal is based on a property’s current value in the real estate marketplace. This is another important reason why the scope of work established by your HUD 203k Consultant and the contractor’s subsequent bids are critical. Detailed contractor bids are an essential element of the appraisal process for an FHA 203k loan. The 203k appraisal is based on the value of the property once the renovations are finished. The appraiser will consider the scope of the work and use it to determine an after-repair value, based on the sales price of comprables in the area that have similar upgrades. Once the bids and a final, detailed list of proposed improvements are available, an experienced appraiser can evaluate the scope of work and compare the estimated value of the completed property to recently-sold comparable sales nearby. Remember, the FHA 203k allows a potential homebuyer to borrow up to 110% of the after-repair value of the home. As soon as the appraisal has been completed, the lender will review all documentation and the appraisal and determine the maximum mortgage amount. If all aspects of the borrower’s application, the Work Write-Up and appraisal are acceptable, the lender will issue a firm commitment and prepare a Rehabilitation Loan Agreement, which establishes the conditions under which the lender will release funds from the Rehabilitation Escrow Account. At closing, the Agreement is executed by the borrower and the lender, mortgage proceeds are used to pay off the seller, and the Rehabilitation Escrow Account is established with the remainder of the funds. *Note: Once the transaction is closed, the borrower is required to make payments on the entire mortgage amount, including the funds that have not yet been disbursed. Depending on the extent of the project, the homeowner has up to six (6) months to complete the work, although the lender may require that repairs be completed sooner. As construction progresses, the work is inspected and approved by a HUD-approved inspector and funds are released through draws to the contractor. A maximum of four draw inspections plus a final inspection are allowed. *Note: If repair costs exceed $10,000, additional draw inspections may be authorized provided the lender and borrower agree in writing. When all work is complete, compliant and approved, the borrower provides a letter indicating they are ready for the final inspection. With sign-off from the HUD-approved inspector and the Final Release Notice, the last draw is paid out, less the required 10% holdback. Unused contingency funds or mortgage payment reserves are applied to the mortgage principal or used to complete additional repairs as per the borrower and lender’s agreement.